When I opened it up, I nearly cried- it's a bit sad to be so moved by fabric, get a grip woman! 'Far and Away II'- Heather Ross for Kokka and Kokka 'Sewing Supplies'. all from the lovely Purlsoho. It will be ages until Far Far Away is available in the UK and when I buy from the US I have to be careful to spend £18 or less- approx $24- to stay under the import duty charges which can be high. Purl soho was the only place where I could chose fat quarters in this range and the Sewing Supplies print is one of my favourites- I have used the linen tape with the same print a lot of projects. I think these are destined for my month in Bee(a little bit) Japanese quilting bee. My month isn't til Feb but I like to be ready. I'll have to audition the colours together. The two fabrics on the left also destined for that Bee, not quite sure. Theses 3 were a bargain from the heyday shop, the two pink prints were in the sale- bargain! These are also for the same quilt- all showing similar colours and some of my favourite things- sewing, tea, bags and fairy tales- makes sense to me anyway. They are all from great UK sellers. The threads print and pink Hope Valley (Denyse Schimdt) are from Gwen at CelticFusion fabrics, the teal Hope Valley from Gone to Earth and the turquoise japanese food/kitchen print from Eternal Maker. I have some others in my stash to go with these and a great idea for a quilt block- I need to test it out before I reveal. I finished the two blocks that I am making for the first month of the Bee (a little bit Japanese) quilting group. All the blocks will feature some japanese fabric and as these were scrap based there are loads of different bits. Kaelin sent a lovely bag of scraps and we can add a bit from our stash and we keep the left overs! Someone else's scraps are always extra good. Looking at the other blocks so far, it is going to be the most lovely quilt. I might have a go trying the same method teeny tiny size. I would've loved this as a girl. It even shows you how to make your own clothes, diagrams on how to thread your sewing machine based on an old hand turned Singer. I was limited to the Ladybird book of sewing and making bookmarks and ball from felt- all very groovy but this would've been fantastic! The print bit is easy, I bought some image transfer paper from ebay and you need a very hot iron and away you go. Importing fonts, flipping text- it needs to be a 'wordart' object to flip- and borrowing an inkjet instead of laser printer, installing software for the different printer etc-thank you to my mum and my husband for help on those. They worked better on a beige thicker cotton twill tape than on thinner white. Sometimes the heat of the iron creates a bit of yellowing and you can't see that at all on the beige tape. One sheet of paper makes a whole lot of labels so thrifty too! Quick shout out-UK sewers can at last now buy Kona cottons in the full range of colour from Mandy at Simply Solids. 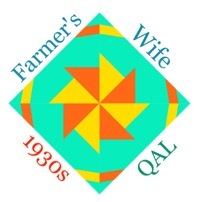 Pop over to Lily's quilts for the huge giveaway to celebrate the launch of this new shop, open to 2nd July, and look at all Lily's lovely stuff as well. Fabric bargains- 40 % off Amy Butler, Anna Maria Horner, Tanya Whelan and more at http://www.fivevalleysdesigns.com/ whilst stocks last. 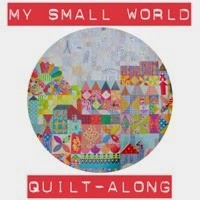 Interested in a quilt-as-you-go quilting bee?- this quilt was made in this method. Contact Tracy, admin for the group http://www.flickr.com/groups/beequilted/. It is a great method if you have a small machine or can't handle the weight of a big quilt easily and fancy some more portable quilting. Take a look at these tutorials- first with no hand sewing here and more traditional with hand sewing here and there are lots more ways of doing this. 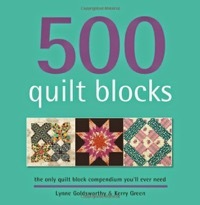 On my recent weekend away I took a new quilting book with me for a bit of light holiday reading and inspiration. It is a beautiful book, the hardcover is printed and slightly textured and the photography inside is a joy. Who'd have thought a dodgy bit of wall plaster and an old metal bed could look so appealing? The writing flows, Jane Brocket has an intimate style. It reminded me of Nigel Slater, his recipe books are often a chance to read his great writing and musings, not just cook up a stew. I love this picture- I fancy the idea of text on the wall, maybe not hymn sheets like this though...It has a different cover in different parts of the world- looks a bit more sedate. Recommend it for inspiration. The tiny teacups that I bought a couple of weeks ago are now pincushions- they are so quick to do. One for my friend Kathy and two for me. The fabric came from an old apron with a great print so great recycling all round. I found these place mats in a charity shop- block printed on linen, unused- 25p each! Did you guess? Coasters, a lovely design by Ayumi at Pink Penguin in the current issue of Stitch magazine. I have to wrap this up for my Modern Swap partner well in advance before I am tempted to keep it to myself- apples are very tempting! News about this nice little swap came in the mail this morning and I couldn't resist- I like to make small things and who doesn't like a swap? Pattern and tutorial are provided and you make in your own fabrics taking your partner's likes/dislikes into account. Tempted? It will be something to use in the sewing area, or it/they could be used elsewhere. What do you like to have with you when you are sewing? Something hot? The Anna Maria Horner Little Folks voile is I the nicest fabric I have ever sewn with. It is soft and silky, cuts well, doesn't slip and is a pleasure to sew. This pattern is Diamond Mine pattern in Sky. It feels just as lovely on and was great for keeping lily white skin covered on the beach. I buy Pochee magazine from ebay and etsy seller pomadour24. All of us restored, rested and home. How lucky did I feel? I loved everything. The bird is in my sewing space so I can see it a lot and I am using the bag and pouch to pack stuff in (we're away this weekend). Thank you so much Mia! I have been meaning to do the post for a while. There is a guy where I live called David who sells his handcrafted creations on a stall in an arts centre called Exeter Phoenix. His goodies always catch my eye when I go in and a few weeks ago I was compelled to buy his Alphabet cards. I hope you learn to tailor tack, I learnt that I have quite veiny arms.